I love high quality baby shoes made of real leather. Shooshoos baby shoes not only look cute, but they let the foot breathe and are a natural alternative to synthetic shoes that make baby feet sweaty. After all, people have used leather to make shoes for hundreds of years - all of that changed only in the past century. 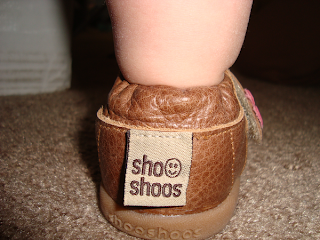 Shooshoos was kind enough to let us try a pair of Tan Smiley shoes and here is what we think about them. Quality & Design: We really appreciate the high quality of these shoes. The leather is soft and they don't look like the type that fall apart, you will get many years of use out of these for more than one baby. The detail at the heel and the little flower are great, loads of comfort and a girly touch. Fit & Comfort: My little girl still walks holding on to one hand. Though I got these in a size bigger than her foot so she can wear them in the spring, she already wears them around the house and doesn't trip over them. 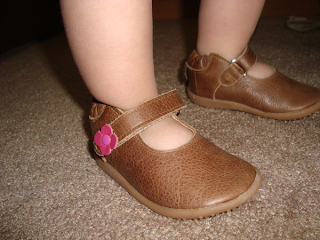 The elastic in at the heel makes them grow with the baby so you can wear them as long as possible. They are also pretty easy on and off with the velcro strap, but not so easy that they would fall off. My favorite part is the sole, it is thick enough to protect the feet and for outdoor wear, but thin enough for the baby to feel the ground and walk confidently. It is very flexible as well and a good match for healthy foot development. Company: As you might have read in the Wiki, the shoes are made in South Africa. This was a concern to me and I asked them about it. I was reassured that South Africa has strict labor laws and the workers are paid and treated fairly. Shooshoos has brought employment to many local people and is a vital part of the local community, so you can feel good about supporting them! Value: Shooshoos shoes range in price from $19.95 to $29.95 depending on what sole you choose. This is good value considering that the shoes are very good quality and may be worn by more than one child. Babies grow so fast! We are only able to wear a pair of shoes for about four months before they are outgrown. It is great to pass them on to siblings, cousins, or the less fortunate.